Secret To More Energy – The Raw Food Diet Plan! What Does The Egg Carton Label Mean? Here’s a list of healthy foods to help you when making choices about which foods to eat. We have tried to include top choices for healthy foods here. All of these provide great nutrition, though of course some are better than others. Most of these foods are nutrient dense, meaning that they have a high ratio of nutrients to calories. In other words, these foods are rich in nutrients instead of a lot of empty calories. The main benefits of each food is in the parentheseis beside it. The Superfoods List is in alphabetical order, as it would be difficult, if not impossible, to try to list the foods in the order of which is the most beneficial. Many of these super foods have links to articles with more detailed information about that food. Please note, that as lengthy as this list is, there are other nutritious foods available that are not on this list. So just because something you like isn’t here, doesn’t mean it isn’t worth eating! This is simply a list of the “high-powered” nutritional foods that are a great addition to your daily diet. Including these foods in your meals is health food made easy! 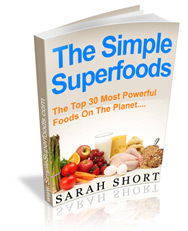 Hope you find this Superfoods List helpful for finding ways to improve your diet!